BANGI, 11 June 2014 – Palm oil mill affluent (POME) can be developed into fish feed called POME BAC which has been found to be a cheap value for money feed stock for aquaculture. Research by a group of four scientists from the University of Malaya (UM) found that POME BAC is organic, non-toxic, rich in protein while convenient to use and is good as aquaculture feed for high value fish. It also cost very much cheaper than the existing aquaculture feeds in the market. 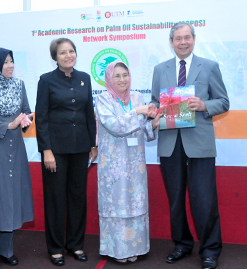 The finding by Prof Dr Chong Ving Ching, Prof Dr Shaliza Ibrahim, Prof Dr Vikineswary Sabaratnam and Dr Loo Poh Leong was presented at the Academic Research on Palm Oil Sustainability (ARPOS) Network Symposium at The National University of Malaysia (UKM) here today. They found that the feed stock from POME can be fed directly to newly-hatched fish larvae unlike fish feed currently in the market which can only be fed after the fish had reached a certain age. They said fish oils and protein used for making aquaculture feed are facing shortages worldwide and POME can thus be very competitive. ARPOS was organised by UKM and its industry partners to galvanise research on a wide spectrum of issues on palm oil sustainability and to come out with accurate information backed by scientific evidence on the industry. The symposium was attended by researchers from 13 universities in the country. They said the use of POME as aquaculture feed stock can also overcome the production of large volumes of POME or oily wastes that will pollute the environment if untreated. This had often been used by critics of palm oil to hit at the industry. POME BAC is now at the pre commercialisation stage and expected to be available in the market by 2016 at the latest. The researchers have also filed their findings for national and international patent rights. Present at the symposium was Tan Sri Dato’ Dr Wan Mohd Zahid Mohd Noordin Governing Council Member of Yayasan Sime Darby, Deputy Vice Chancellor (Industry and Community Partnerships) Prof Dato’ Dr Saran Kaur Gill, researchers and industry partners.